In this edition of “Striking the Right Balance,” Estephanie Sta. Maria-Vendiola audiologist with Fraser Health Authority at the Surrey Memorial Hospital in Surrey, BC, shares their thought-provoking journey through creating a vestibular screening to address long wait times for vestibular assessments. These are the four most commonly read words in a vestibular patient’s referral. Our audiology department at the Surrey Memorial Hospital receives upwards of 400 new referrals a year for vestibular assessments, which add to our already long list of patients “not yet diagnosed” and awaiting assessment. As with most publicly funded healthcare sites, the high volume of referrals we receive outnumbers the available resources, including facility space and qualified clinicians. The situation is imbalanced. Living with dizziness and imbalance is challenging, even more so if it remains unaddressed – often associated are safety concerns, increased risk for falls, and increasing anxiety from their condition. Overall quality of life is impacted. It is not uncommon for patients to share their experience that, “it’s hard to be taken seriously when no one has determined what the problem is yet.” For many of our patients, their dizziness and imbalance are unaddressed invisible disabilities. Review physician referral and consultation letter (if available) and patient-completed questionnaire and Dizziness Handicap Inventory (DHI) score. Identify whether abbreviated vestibular screening or a full audio-vestibular assessment is appropriate level of service for patient. Decision-making is based on patient’s description of their dizziness onset, including presence of true-spinning vertiginous sensation, any associated aural symptoms, and their current persisting symptoms including its impact on everyday life (i.e., as per DHI score). It is also worth noting that descriptions that appear suspicious of BPPV is defaulted to receive a vestibular screening, so that repositioning maneuvers (if need be) can be performed at a timely manner. Moreover, patient’s descriptions that are non-specific and vague (e.g., headache, pressure-in-head dizziness, lightheaded feeling, etc.) are also assigned to receive a vestibular screening. If screening outcomes warrant further additional vestibular testing, an appointment would be scheduled within two months. In the initial stages of our screening pilot, two major roadblocks were encountered: (1) Equipment purchasing, and (2) Incomplete case history. We had underestimated the length of time and approvals required for equipment purchasing, which proved challenging as the grant only allowed for three-months to do the pilot. And most critically, incomplete case history pushed the “pause button” on our action plan – a pause that turned out to be an incredible learning opportunity! “The structured case history enables the clinician to acquire, in an organized fashion, information that can be used to formulate a working hypothesis of the origin of the patient’s complaints that will either be supported or rejected based on the results of quantitative testing." 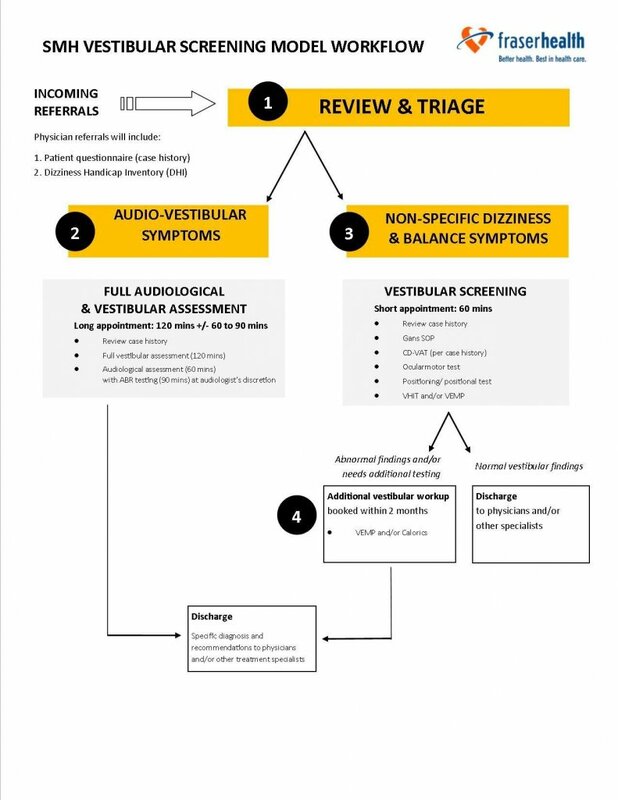 Cognizant of the indispensable power of a good case history, we revised our triage approach to allow for intake case history, via telephone, with an audiologist. Although this approach was time-consuming and challenging (i.e., difficult to accommodate patient’s best-time-to-call request), this extra effort proved invaluable. Intake case history allowed for rapport building, minimized no-shows, and endorsed better patient care as clinicians had preparatory understanding of each patient’s condition prior to their assessment. Furthermore, the telephone intake allowed for preliminary conversations, which afforded opportunities for patient education and counselling that address their ongoing difficulties. Another unexpected and important outcome are with patient who reported having already received an assessment and/or treatment elsewhere; these patients subsequently self-elected to be removed from the waitlist. And just like that, I had my giant lightbulb moment. To this day, that conversation resonates in me with each referral and patient we encounter. As an audiologist in the public sector, it is true that we are a unique commodity in the healthcare space, and that equivalent diagnostic services in the community are scarce and, if available privately, can be too costly for most patients. While every audiologist is trained in diagnostics, not all will have the dedicated time, experience and knowledge that comprehensive audiology assessments require – this is especially true for vestibular assessments. As described by our BC colleague Glynnis Tidball in a recent article – The Case for Diagnostic Audiology (http://www.canadianaudiologist.ca/issue/volume-4-issue-2-2017/diagnostic-audiology-feature), there is an audiology crisis that needs attention. A key learning gleaned from the vestibular pilot project was the acknowledgement and reinforcement that our Audiology Department at Surrey Memorial Hospital is a designated diagnostic site. With our vestibular services, this means we cannot simply pre-assign patients to only receive a screening/triage service versus a full vestibular workup. While the screening process helped identify those patients with active or uncompensated vestibulopathy, we were left with uncertainty when only “normal” findings were obtained. We could not completely conclude there was “no peripheral vestibular cause” for the patient’s symptoms (based on a referral that was now a year old!). As such, we ended up recalling all those patients for a follow-up vestibular assessment to conduct those tests not performed in the screening. Presently, the vestibular screening approach is discontinued. The primary reason for this is the likely outcome of minimal reduction in our waitlist, which was our primary goal. Similar to most publicly funded sites, the imbalance between patients and available resources (i.e., space, equipment and clinicians) is complicated and confounded by many contributing factors yet to be addressed – the lack of direct partnership with referring physicians and rehabilitation team at our site, outdated medical billing codes to support need for costly equipment and sufficient staffing to provide vestibular services, and the lack of trained and qualified vestibular clinicians available, to name a few. While the vestibular screening did not prove feasible in addressing our department’s needs, its outcome validated our identity – Surrey Memorial Hospital is a diagnostic site. Our role in the vestibular patient’s care is to help the patient and his/her healthcare team reach an accurate diagnosis. We believe it is important for all vestibular patients to receive a complete vestibular assessment, including a comprehensive intake case history. Only patient-specific factors (e.g., recent neck injury) should affect which tests should be performed. Altogether, reflections on our pilot project’s outcomes affirmed the need for our site to provide a comprehensive vestibular evaluation that is worth the wait. Constantly, we are learning and striving for the right balance, as we seek ways to improve our diagnostic audiology services at Surrey Memorial Hospital. Inspired by the efforts and outcomes of our pilot project, we presently are redesigning our vestibular services. We aim to improve efficiency and better serve our patients, while also caring for our clinicians’ caseloads. We are focused in seeking support, initiatives and partnerships from physicians and stakeholders. We are dedicated in advocating for proper funding of our services. We keep moving forward and remain hopeful, proactive, and tuned in. Estephanie Sta.Maria-Vendiola is an audiologist with Fraser Health Authority at the Surrey Memorial Hospital in Surrey, BC. Her caseload includes both adult and pediatric diagnostic assessments. She obtained her Master’s of Science in Audiology from the University of British Columbia and her certificate of Vestibular Assessment and Management from the American Institute of Balance in Largo, Florida. Also, Estephanie is experienced in knowledge-translation activities that translate research into engaging health promotion resources, including development of web-based content, blog posts, and promotional videos. She is interested in applying this experience in promoting Vestibular Audiology resources to patients and their family, as well as other healthcare professionals. She supports initiatives of the BC Balance and Dizziness Disorders Society (BADD) and Vestibular Disorders Association (VeDA), and is a volunteer member of the Canadian Academy of Audiology’s National Vestibular Special Interest Group. She enjoys community collaborations and professional engagements, and previously had served as the Audiology Practice Council co-chair for Fraser Health. All things audiology, technology and coffee are among her many passions.